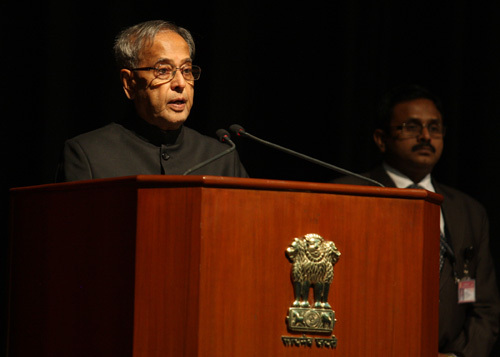 SPEECH BY THE PRESIDENT OF INDIA, SHRI PRANAB MUKHERJEE AT THE PRESENTATION OF THE FIRST COPY OF THE BOOK "CONTEMPORARISING TAGORE AND THE WORLD"
At the very outset, I would like to express my deep gratitude and appreciation to the organizers of this function for inviting me to receive the first copy of the publication, "Contemporarising Tagore and the world”. The book is the result of a joint India - Bangladesh venture to commemorate Gurudev Tagore’s 150th birth anniversary. This is entirely consistent with the reverence with which Gurudev Rabindranath Tagore is cherished in both India and Bangladesh. We have both preserved and celebrated the legacy of this great sole as an intrinsic part of our shared heritage. In both our nations, songs that he composed became our national anthems. Both our peoples are re-discovering the contemporary relevance of Tagore’s insightful thinking on issues that are at the core of our contemporary challenges. Be it politics, social reforms including gender equity, rural development, religion, education, aesthetics, philosophical discourse and international relations, Gurudev had inspired many of our greatest national leaders with his rational and humanist approach. The conference on "Contemporarising Tagore and the world”, held in Dhaka in May 2011 and graciously supported by Prime Minister Sheikh Hasina, was certainly a high point in the celebrations. The papers presented in that Conference which have been compiled in this publication, had aptly highlighted Tagore’s versatility and his genius. They have re-evaluated and re-analysed his profound contemplations on humanism, nationalism, internationalism and cosmopolitanism, his views of state and society and of science and civilization, and his ideas of education and comparative literature - among others. These papers will contribute in a significant way to a better understanding of Tagore the philosopher, writer, composer and artist and provide an excellent means to appreciate the importance of his reflections and ideas for seeking solutions in the current difficult context, be it national, regional or global. I congratulate the Indian Council for Cultural Relations (ICCR) that has played a central role in the successful conduct of the Conference, in cooperation with counterpart institutions and agencies in Bangladesh. When we recall Tagore, what comes to mind is his abiding love for pluralism and multiculturalism in an open society and his deep commitment to his civilisational roots, combined with an internationalism that readily accepted new ideas and methodologies. I cannot emphasise enough how important these values are today. Tagore simultaneously had a deep interest in rural reconstruction and development strategies, including rural credit as essential inputs for creating a better balance in society. He believed in the need "to give a central place to society (samaj) and not the State (rashtra)”, and felt anguished that the "syncretic civilisation” of India – that he so deeply believed in was being threatened by "casteism, communalism and purblind traditionalism”. His first hand experience of the plight of the marginalized farmers was compelling. He wrote,” "gradually the sorrow and poverty of the villagers became clear to me, and I began to grow restless to do something about it. It seemed to me a very shameful thing that I should spend my days as a landlord, concerned only with money making and engrossed with my own profit and loss.” He conceived a multipronged strategy that included education, co-operatives, rural credit and banking, agricultural technology and medical programmes. Most of these, as we know, are not only relevant, but provide the simple solutions to some of the vexing problems that have delayed development in many parts of our region. The more distant will your own welfare be”. Tagore has been described as a "universally minded humanist” and who had written, "Manusher proti biswas harano paap, shey biswas shesh porjonto rakkha korbo” ( meaning, I shall not commit the grievous sin of losing faith in human beings) . It is with such a guidance that we should whole heartedly apply ourselves to correcting the path that our society is presently pursuing. There is something very wrong in our moral make up and we have no one to blame as long as we do not make a conscious effort to anaylse the symptoms and their causes. Tagore was inspired by the Upanishads and Gita, by the Bhakti movement in India and the philosophy of the Bauls in Bengal. In all of these he saw the need for man to discover the God in himself and steer his actions accordingly, with a sense of his dharma and a sense of purpose. How important these principles are today- regardless of the religion that we practice. In both his paintings as well as his lyrics, Tagore never failed to pay tribute to women and their crucial role in the evolution of a better society. We are only too aware of his intense focus on the transformational role of education and its impact on children, women and young adults and his emphasis on women's empowerment and their role in changing societal mindsets, both within the family and in the wider community. He had written, "I join in the recognition given in India to woman as shakti, the living symbol of divine energy whose inner shrine is in the subconscious depth of human nature and outer manifestation in sweetness of service, simplicity of self-dedication and silent heroism of daily sacrifices”. These have always been at the core of the basic value systems in India. We need to revive these guiding principles that are fundamental to our way of life. We cannot afford to dilute the Indian way. Tagore had described the India that he loved as "an idea and not a geographical expression.” We need to revive such a pride and love for our nation and our people. As I leave this thought with you, I would like to express my deep appreciation to Prof. Arefin Siddique, Vice Chancellor, University of Dhaka for his presence here today. He is foremost among the erudite and influential people in India and in Bangladesh that have, through their work and leadership, brought the peoples of our two countries ever closer to each other. Their sustained efforts have transformed our bilateral discourse and brought about a unique mutual understanding between our nations at multiple levels. I wish him – and through him, all the contributors to this publication every success in their future endeavours.